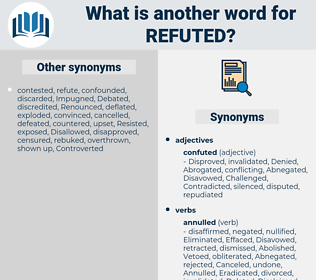 What is another word for Refuted? repudiated, rejected, rejects, invalidated, Refused, Contradicted, criticized, disputed, Repelled, Argued, Retorted, Responded, nullified, Denied, Overruled, Disagreed, stressed, Quashed, noted, discarded, debunked, Annulled, defeated, spurned, released, Challenged, Shunned, Belied, Objected, objects, pointed, Declined, showed. 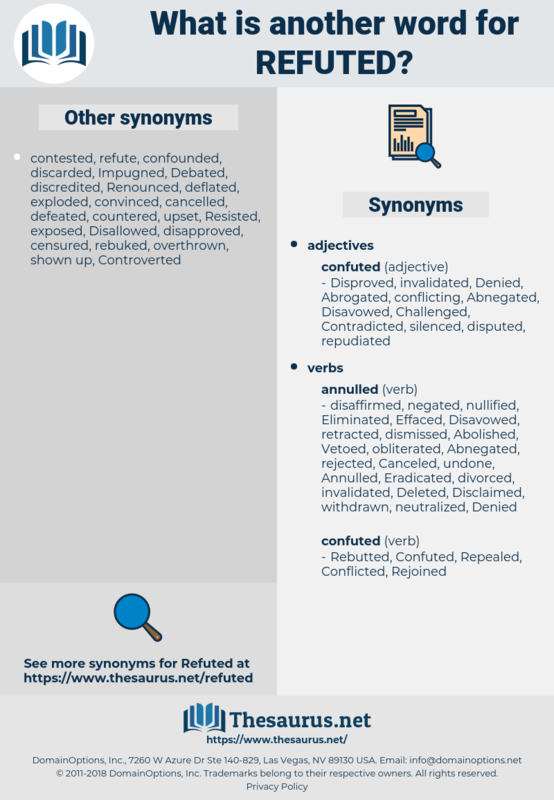 rejected, Contradicted, disputed, Argued, Denied, addressed, opposed, contested, continued, confounded, Challenged, Belied, exploded. overturned, dismissed, contest, Disallowed, contested. From it, they are most easily refuted, who, like Schultens, understand the whole verse as a threatening. In support of the continuance of such a traffic, he knew of nothing but assertions already disproved, and arguments already refuted.